A famous abode of Lord Narasimha in Andhrapradesh. Actually, this is a cluster of nine Narasimha temples. Each one worships Lord Narasimha in his different manifestations. 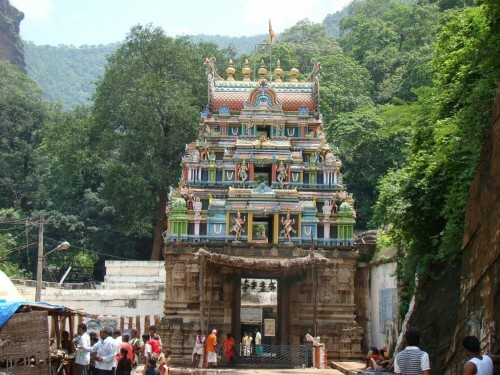 Thus we have Bhargava Narasimha, Yoga Narasimha, Chtravata Narasimha, Ahobila(Ugra) Narasimha, Varaha Narasimha, Malola Narasimha, Jwala Narasimha, Pavana Narasimha, Karanja Narasimha temples, spread around the Ahobilam hill. These nine temples are together known as Nava Varaha Kshetras. Out of this, Yoga Narasimha temple (also known as lower Ahobila temple) and the Ugra Narasismha temple (known as the Upper Ahobila temple) are the most important one. The legend is that Lord Narasimha killed the demon King Hiranyakasipu at the upper (Ugra) Ahobilam temple to save his devotee. Prahlada(son of Hiranyakasipu) from the demon�s harassment. After that he is said to have given his darshan to Prahlada at Lower (Yoga) Ahobilam temple. There is a pillar at the lower temple, depicting Lord Narasimha as emerging out of a pillar to kill demon Hiranyakasipu � as described in the Bhagavatha Purana. Legend tells us that after killing the demon, Lord Narasimha wandered around the hill to cool his anger. The other seven Narasimha temples on the hill mark the spot where he rested; while wandering about. The main lower Ahobila temple is built on Vijayanagara style; the Alwar Koneru, nearby fresh water Lake, is worth a visit. Ahobilam is 363 kilometers from Hyderabad. Kadappa (118 kilometers) and Nandyal town (74 kilometers) are the convenient rail heads.